Enferex and I had spent some time (along with others that were at the lab on various days) updating the Skill Crane to run on a more modern setup. 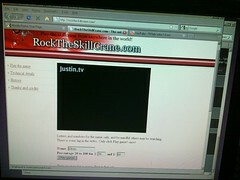 It was fully streamed 24x7 via Justin.TV and had the ability to submit moves without page refreshes. Also, the player's name and coordinates of play were burned into the video real time. It was great. But then the hard drive in the computer randomly died. Not just a click of death, it's a clack of death. Some of the information was saved, some of it is in svn. The system will be back in a week or so. Perhaps sooner with the long weekend.